How do you start yours. Direct sown, transplants. SeaHawks (21) 49ers (6) in the 3rd. that seems to be all anyone grows around here with exception to one guy that was selling Chioggia. I am going to give the Early Wonder Tall Top a go next year (mom and friends really like them) along with Blankoma, good reviews from taste tests according to West Coast Seeds. SeaHawks (28 ) 49ers (6) in the 3rd. Blankoma and Chioggia look like a novelty, how do they taste? Among the few times that I tried them, I bought some kind of golden beets at the farmers market and they were REALLY good. Sweet but not as strong beety flavor as the red ones. Less mess with the staining, etc. p.s. That said, I tried growing three different kinds. None of them did very well. I might need growing tips as well. Last year was the first time I ever grew beets in the garden! It was quite a successful crop. We grew 2 kinds. Detroit dark red, and the other was bull's blood (I think). I couldn't tell the difference in taste, but the detroits were better as far as getting black scab. We sowed seed right in the dirt in february. we mulch heavy with straw. I just planted more today for a winter crop. I'm not really sure how they will do. We planted the detroit dark reds again. We didn't need to feed them in the spring, however, our dirt is very fertile. I am really interested in growing some of the showier types. Not sure how they taste, but if I saw them at our farmer's market, I would buy them at least once just for the sheer novelty. Nothing more interesting than striped or miscolored rare veggies! I've tried 2 years in a row growing beets and yeah, no luck!!! I like beets boiled. only problem is I get beet urea. bah! I haven't tried them Eric, sorry. As for eating the Early Wonder's, i just slice them in half lengthwise, and then a little bit of olive oil, salt and pepper and into the oven they go. Skin on? Kind of like baked potato? I plant Detroit Dark Red. I plant about on the date of average last frost or maybe a week earlier. Direct seed them where they will grow. I am still harvesting beets, and they keep getting bigger. Right now most are the size of softballs. Even these large ones are of good flavor and texture. Thin them to stand 2 to 3 inches apart and when they are small and use the greens. You can thin them again when the roots begin to touch each other. That crinkly thing you call a seed is actually a capsule with several seeds in it. You must thin beets. If you want nice large ones they need to end up standing 4 to 6 inches apart. Yes, they respond well to fertile soil. We make pickled beets, bottle cubed beets in the pressure cooker, steam the greens, and peel, slice and steam the beets for fresh eating. Served with butter and red wine vinegar. About radishes. They can be planted early too. Take the time to individually place the seed 2 inches apart each way. Keep them damp. If they dry out they will bolt. Full sun. With all of the root crops, thinning the plants will give you earlier and larger roots. If you want turnips 3 inches in diameter, you must have them spaced at least 3 inches and 4-5 is better. Two roots can't occupy the same space. The leaves also need the space to gather sunshine. Spacing the seed at planting time is actually easier than thinning later. I also have a recipe for Red Root Relish and it's on my favorite canning recipes in the recipe forum. applestar wrote: Skin on? Kind of like baked potato? I eat the skins too, if they are anything like taters thats where most of the nutrients are in and just under the skin... well thats what i've been told anyways. Beets? YUCK! However we do grow the dark red, as dh loves the greens and the beets. I pickle them and boil them for him. 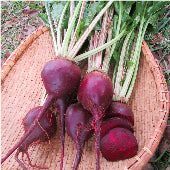 When you look up beets, they say they have an earthy flavor and that is so true. They taste like dirt. Golden beets didn't have that strong earthy flavor. There must be difference in flavor among the varieties too. I grew Detroit dark red last year and tall top early wonder this year. I've found both to be good, though DDRs seemed to get a little bigger. Oh and check out the long season lutz beets: Supposedly, they stay tender and tasty while huge. The deer at the tops of mine so badly that they never had the chance to get totally huge, probably because their lack of leaves did not allow them to generate as much growth.